The date and time for the third annual Tide Tipoff event, featuring both the men's and women's teams, has been announced. The event will take place on Tuesday, October 24th at Coleman. Doors open at 6 P.M. CT, with the court activities beginning at 7 P.M. Be sure to get there early as the seating will be general admission. The game time for Alabama's home game vs Oklahoma in the Big 12/SEC Challenge will be 1:15 P.M. CT on Saturday, January 27th. 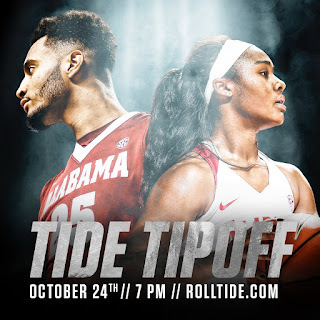 ESPN will handle the television duties, but I implore any and all Bama fans in the area to head out to Coleman to support our guys in what could be a very important non-conference matchup. I expect Oklahoma to bounce back after a really difficult season a year ago when the Sooners finished with an 11-20 record. A few quick recruiting notes: Robert Woodard II, a top 100 recruit in the class of 2018, took an unofficial visit to Alabama earlier this week. Woodard appears to be one of the staff's top targets for the 2018 class. He was voted the Gatorade male player of the year in the state of Mississippi for the 2016-17 season after averaging 25.2 ppg, 13.1 rpg, 3.2 apg and 3 bpg. Woodard is a physical specimen, more than capable of playing right away at whatever college he chooses to attend. I've been very impressed watching him, and would be ecstatic if he chose Alabama. Mississippi State has long been considered the favorite to land Woodard, in part because his father played there. Jared Butler - a 4-star guard in the 2018 class - will be in Tuscaloosa this weekend for an official visit. Javian Fleming - a 3-star center in the 2018 class - listed five schools (Alabama, Georgetown, Iowa State, TCU and Texas A&M) that he would be taking official visits to. It was announced tonight, via several sources on Twitter, that Javian has canceled his official visit to A&M, which was scheduled to take place next weekend. No idea if it means anything where Bama is concerned; I'm just sharing the information.